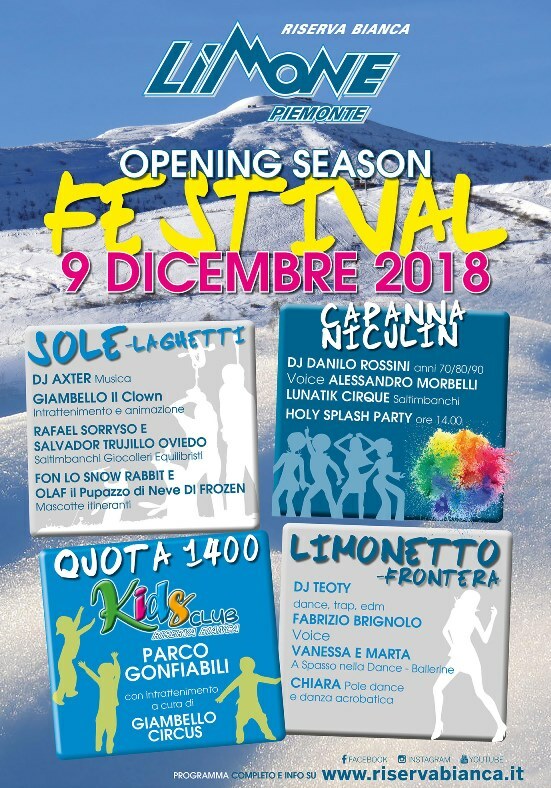 Sunday, December 9 will be staged the next major event by Riserva Bianca: 4 stations, 4 musical settings, 4 styles of entertainment, 4 reasons to have fun on the snow of Limone Piemonte! - Sun Zone arrival Gondola - Lakes: station dedicated to the fun of children and their families with clowns, acrobats, jugglers, balanceists, mascots and animated puppets, as well as music with DJ Axter and animation dedicated to Giambello clowns. - Capanna Niculin - Pancani: area dedicated to music 70-80-90; the DJ Danilo Rossini and the voice of Alessandro Morbelli will animate a day of music and fun enriched by the vicissitudes of the professional acrobats Lunatik Cirque. In this station will also be organized the fun Holy Splash Party: 14.00 hours all ready to have fun to the sound of ... colors! - Quota 1400 - Kids Club: inflatable, games and entertainment for our little friends who do not ski and for their parents, convenient near the parking lot and the huts accessible by car and bus. - Limonetto - Frontera: a real dj set at high altitude thanks to the beautiful Marta and Vanessa that "A spasso nella dance" will dance with all participants to the notes of the dj Teoty and with the voice of Fabrizio Brignolo, just to make sure nothing is missing, the station will be enlivened by the acrobatic dance and poledance of Chiara.